A Disney wedding at Stapleford Abbots Village Hall! Huge congratulations to Natasha and Scott who were married in a church service in Hornchurch followed by a reception in Stapleford Abbots. 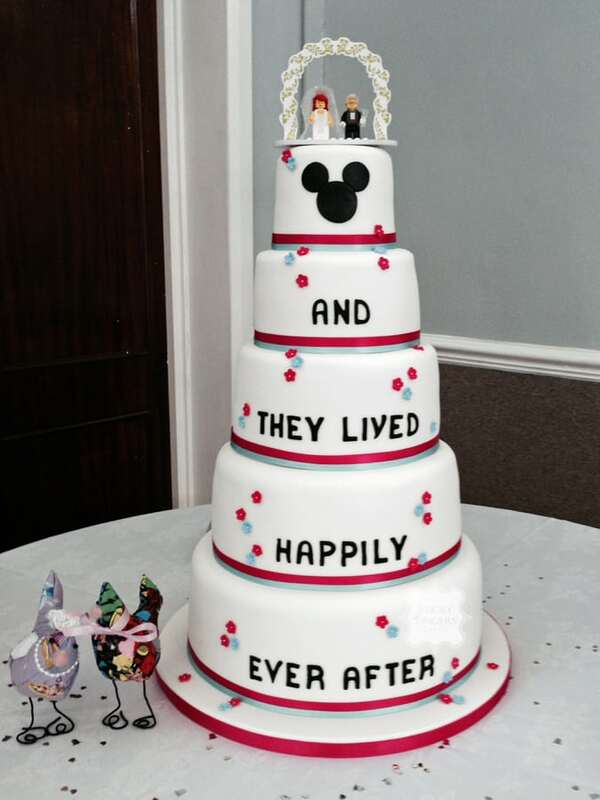 I was asked to make a 5 tier wedding cake, specifically using the wording “And they lived happily ever after” on the cake with Mickey Mouse ears on the top tier. It all became clear when we delivered the cake to the hall. The time Natasha and her friends and family had taken making the hall look like a Disney wonderland was apparent! The bride and groom chose 5 different cake flavours; Black Forest, Lovely Lemony Lemon cake, Red Velvet, Orange Zest and White Chocolate and Passion Fruit, lots of lovely varied flavours for all tastes. Lots of love and happiness for the future..